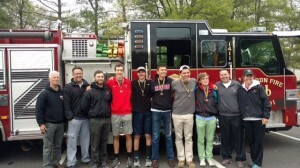 The Haddonfield Crew Club rowed to great success at the City Championship Regatta on the Schuylkill River on May 1. More than 71 crew clubs comprising 545 boats competed at this annual event, and Haddonfield took top honors with a 3rd place finish in the Boys Varsity 4+ category (represented by Luke Small, Max Levin, Lachlan Mersky, Blaze Gianguilio and coxswain Owen Hart) and two 5th place finishes by the Varsity Girls 8+ boat and the Varsity Girls 2nd 8+ boat. With these impressive finishes, all three of these boats also qualified to go to SRAA National Championships in Ohio at the end of May. The City Championships Regatta also served as the New Jersey State Championships for 2016 because the Garden State Regatta was cancelled this year due to the closure of the Cooper River for the dredging project. The Boys Varsity 4+ boat’s impressive results placed them as the fastest boat in New Jersey, and crowned them New Jersey State Champions. They received the traditional fire truck ride on Wednesday night, May 4 through downtown Haddonfield. Pictured from left to right are Coaches: Tom Thomas, Frank Criniti, Matt Bowen, and Rowers: Luke Small, Blaze Gianguilio, Max Levin, Lachlan Mersky, Owen Hart, and Coaches: Tim Hagan, and Julie Close. In a similar fashion, the Varsity Girls 8+ boat took an impressive 3rd place for the New Jersey State Championships in their category. The boat consisted of Elena Kommedal, Abby Bentley, Carolyne Bollentino, Christie Castorino, Annelise Rowling, Kate Donohue, Kiernan Loue, Mia Ippolito, and coxswain Emma Tranfalia. Additionally, the Varsity Girls 2nd 8+ boat took 2nd place in their category for the New Jersey State Championships. The boat consisted of Kathleen Hohweiler, Shannon Murphy, Maggie Clapp, Carlee Riordan, Regan McDonnell, Hannah Roche, Elizabeth Knox, Gabrielle Owens, and coxswain Abigail Griffith. Please see the Haddonfield Crew Club website at www.haddonfieldcrewclub.org for more information on the team, and registration for the annual Learn to Row program in June for interested 7th and 8th graders.